This card took a while to make but I had it in my mind and just had to create it! I started out with basic white card as my base. I printed out the letters LOVE large enough to fit the card. I traced out the letters and transfered them to the card. Using the quilling crimping tool I crimped several strips of dark pink quilling paper. I put a thin line of glue on the outline of each letter (it's easier to do this half a letter at a time) and carefully glued the crimped paper on it's side outlining each letter. Leave to dry. Quilling tools are pretty essential as are tweezers! I filled each letter with varying sizes, shapes and colors of quilled shapes. I then added another outline of crimped paper in a lighter pink around each letter. Leave to dry. 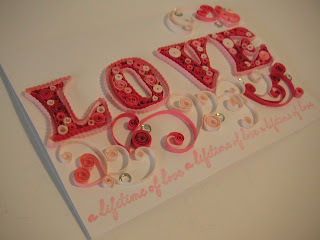 I then stamped the text at the bottom of the card 'a lifetime of love' in a light pink ink. 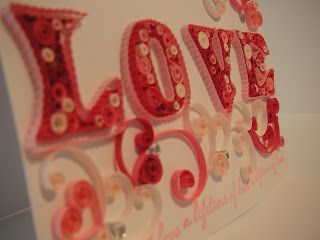 Meanwhile I made a series of quilled scrolls, double scrolls, coils and heart shapes in various shades of pink. I just let these flow naturally underneath the text and a little above on the right. This takes some playing around with but you just have to let each piece 'grow' from the next, that's the best way I can describe it. I glued each of these in place. To finish I added a few diamontes here and there for a little sparkle. Quilling does take time and patience but the results are rewarding. 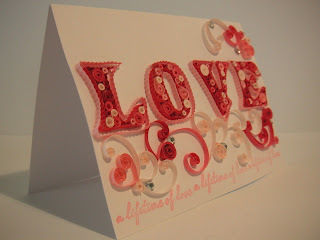 Have a go at adding some quilled elements to your cards. You might just become addicted like I have! Studio G clear stamps a lifetime of love. this card was very beautiful, I loved! thanks Nati, I love your blog, your work is amazing! So pretty and unique!!! I love your Love card!! OMG, this is fabulous. I obviously have not used my crimper enough because I LOVE the way it enhances this card. I really like using the crimping tool, especially for foliage on flowers, this card took a long time! !